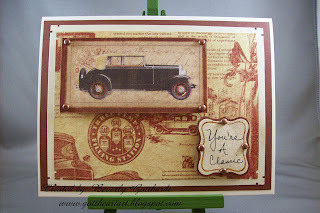 I'm doing a quick edit here because over at CCEE Stampers their challenge this week is for Father's Day or a Male Birthday and since I just posted this last night I feel it's new enough for their challenge also. I don't think I can come up with a much better Father's Day card than this one. I just love these papers. When you have papers as spectacular as this sometimes it's hard to stamp on them. I tried creating the Curly Label punch in My Digital Studio, but couldn't get the background to match the papers good enough. I'm still practicing with that software. I looked through my letter stamps, but finally decided since this card is for my Sons' to give to their Dad I would just use my handwriting. So, no stamping, but a little bit of distressing on the Curly Label with one of my CTMH distressing tools and some sepia ink, corner punches, and brads. Wah Lah, a classic. This is for a new challenge I found, looks like it's going to be a fun one. A new challenge each Sunday, click on the link and check it out if you haven't already. Supplies: Ivory Card Blank 5" X 6 1/2" Halcraft, Papers: Graphic 45-A Proper Gentleman Collection, brown and cream unknown, Ink: Ranger Archival Ink-Sepia, Marvy-pointed edge punch, Stampin Up-Curly Label punch, Stampin Up-Sizzix Bigz Top Note Die, CTMH marker-brown bag, American Crafts-copper brads, pop dots. Your card is gorgeous and I love the vintage feel! Thank you for your kind comments on our blog and thank you for joining us this week at Always Playing with Paper. I just had to comment on your card it's fabulous. Another devotte to Graphic 45, I love their papers. Beverley, I LOVE the classic card. Your layout is fabulous and I think the fact that you wrote the sentiment actually adds so much to the card. Love the colors, too. Gorgeous. Thanks so much for joining the Paper Players in our inaugural challenge.